More than a game - that's the motto for a match which will be the last public appearance on the field for one of Germany's most capped internationals. With the stadium filled to its 50,000 capacity, some great names of the past and present on show and all proceeds going to children's charities, Juergen Klinsmann's farewell match promises to be an occasion which stands out from the usual run of benefit matches for retiring soccer stars. In fact, it will be very much an unofficial testimonial for the striker, capped 108 times for the German national side. Klinsmann was refused a benefit match by the German Football Federation (DFB) which changed its guidelines on such games a few years ago. With the football calendar already full, it decided to make no exception for even this outstanding ambassador for the German game who, after expressing some bitterness at the intransigence, deciding to go ahead and organise his own public farewell. It takes place on Monday at the Gottlieb-Daimler-Stadion in Stuttgart, Klinsmann's home city and the home ground of VFB Stuttgart, where he first made a name for himself in the Bundesliga. Klinsmann scored 79 goals in 156 Bundesliga games for Stuttgart between 1984 and 1989. The son of a local baker, Klinsmann is proud to be a Swabian, a folk noted in Germany for their meanness in money matters. That's not the case with Klinsmann who is giving every pfennig of the proceeds of the match to children's charities. ''This is the first time that a player will be giving the entire proceeds from a benefit match to good causes,'' said Stuttgart club president Gerhard Mayer-Vorfelder. The game comes almost a year after Klinsmann made his last appearance for Germany in the World Cup defeat in France to Croatia. Now 34, he lives with his wife Debbie and two-year-old son Jonathan in California. 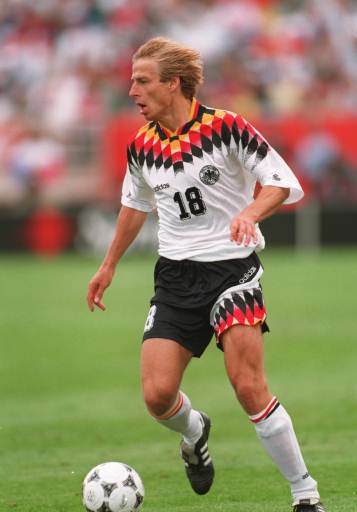 Klinsmann, a World Cup winner with Germany in 1990, plans to play one half of the 90 minutes each for the two teams, the ''VFB Stuttgart All Stars'' and ''Juergen's Dream Team''.